Keylon B. was born in Atlanta, Georgia August 20, 1974. He graduated from Benjamin E. Mays High school in 1974. After attending Atlanta Metro College for 1 year, Keylon went to work for Dickies Warehouse as a packer. During this time, he became a Certified Forklift Driver. He left Dickies to work at 1 st Multi Industries, then at United Stationers and Techniweld over the course of about 20 years. After losing his job at Techniweld in 2015, Keylon states that it had a ‘Domino Effect’ where he lost his ‘Footing’ and became homeless as a result. During this period he says he took on some bad habits and suffered from depression that contributed to extending his homelessness. 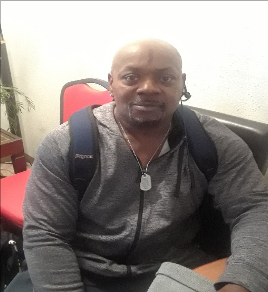 Keylon came to Homes of Light in June 2018 and says that the agency gave him the opportunity ‘to get back on his feet’ and avoid the influences he had been subject to given the stable and positive environment he was now in. Keylon found employment as a Security Guard at Grady Memorial Hospital and has worked full time since. Now that he has found employment, Keylon has secured an apartment and looks forward to spending more time with his 18-year-old son collaborating on Rap and R &amp; B music.